Happy Monday Divi Nation! 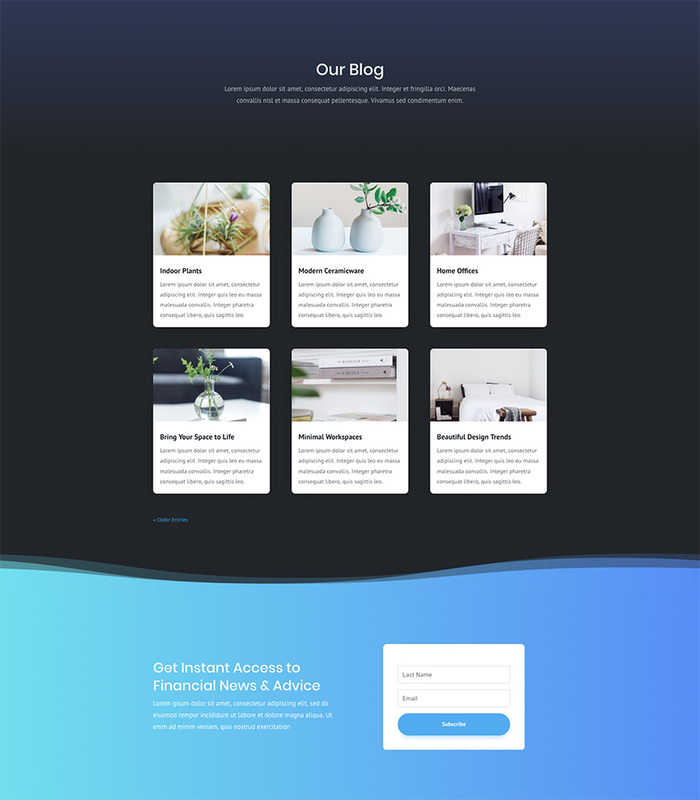 Thanks for joining us for the next installment of our weekly Divi Design Initiative; where each week, we give away a brand new, free Divi Layout Pack from our design team to you. 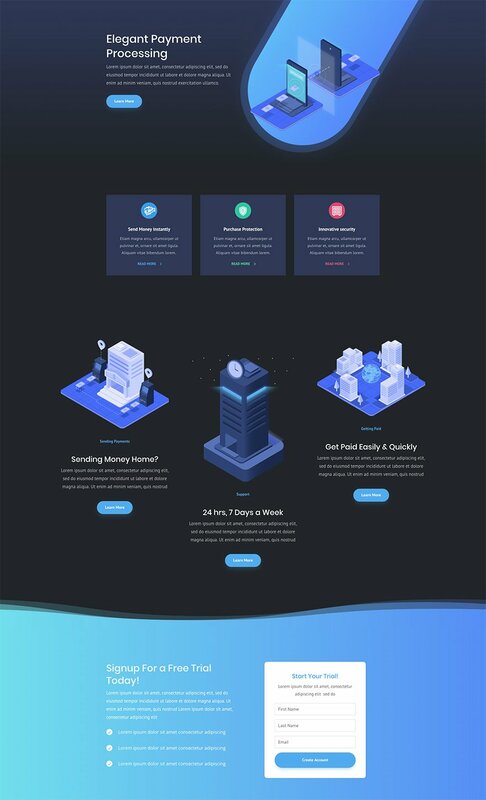 This week Kenny and his team have created a very elegant Digital Payments Layout Pack with eight different pages included everything from a blog page to a sugnup page for new member registration. Basically, any Digital Payment Company would have everything they needed to get a site up and running in minutes. 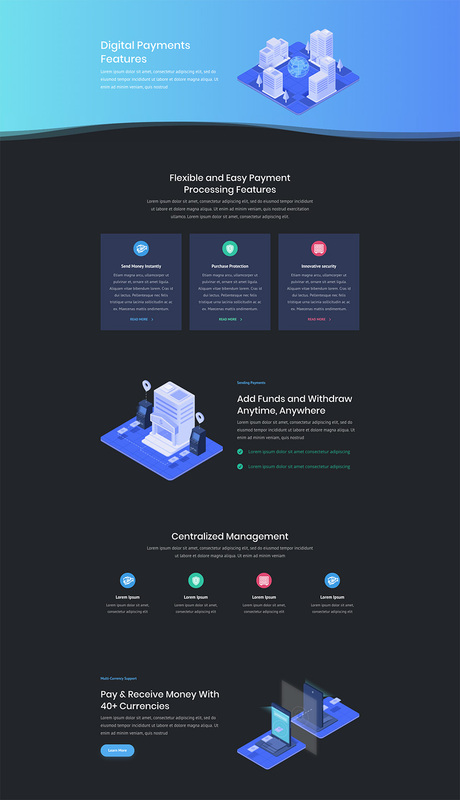 This Digital Payments layout pack is designed to provide all the necessary pages to get an online digital payment company up and running in no time. Some of the key pages include a Signup page which will work well as a registration page. And the features page gives an exceptional framework for showcasing all featurres associated with the product. It would be easy to use the different elements on these pages (like those feature boxes) to add more content. 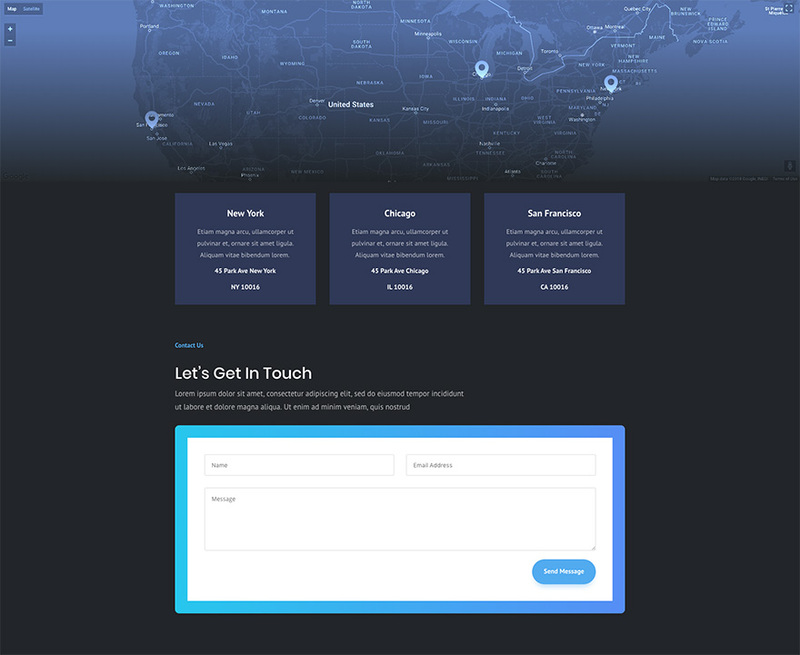 Also, the map on the contact page is unique and fits the design theme perfectly. I know you are going to enjoy this layout pack. To use the Digital Payments Layout Pack on your own Divi website, you will first need to download it using the button below. To gain access to the download you will need to subscribe to our Divi Daily email list by using the form below. As a new subscriber you will receive even more Divi goodness and a free Divi Layout pack every Monday! If you’re already on the list, simply enter your email address below and click download. You will not be “resubscribed” or receive extra emails. Once you have downloaded the layout pack, locate the divi-digital-payments-layout-pack.zip file in your downloads folder on your computer. Double click the folder to unzip it and then navigate inside the divi-digital-payments-layout-pack folder. Inside this folder you will find 8 files, each of which is a unique layout that you can import into your Divi Library. To do so, navigate in your WordPress Admin to Divi > Divi Library > Import & Export. You can select the individual layout you desire or choose the All Layouts file to important everything at once. We hope you enjoy this Digital Payments layout pack. And to help ensure that you do, we’ll be doing a live stream on our Facebook page this Thursday at 3pm EST to walk through what it might be like to actually use this layout for your own website. Looks great. Any news on Divi and Gutenberg and will they break existing sites? Want to get a life time membership but waiting to see what happens. Will there also be a layout for photographers or car Trailer hire? I have no clue what Gutenberg is going to do with the DIVI theme. Right now Gutenberg is in beta at this point of time and since WordPress 4.9 a whole mess load of free Gutenberg plugins adding in such blocks as a Google Map block, spacers block, pricing table and more have popped up. With the Gutenberg plugin installed you can still use the classic editor which will allow you to use the DIVI builder. For photographers you can use portfolio site. For Car trailer, you can use divi and build your own creativity, or can hire any designer who is good at it. I’m not a lover of dark themes… until now! Many thanks to Kenny Sing and team for another top drawer layout. Great Theme, thanks for all of amazing resources you guys make available for the Divi Community. Now as a member where do I download the themes without having to input my email over and over again, are those themes available in the download area? Because I have not see them there. This is the only way to download them right now. Everyone always asks pretty much every theme they give away. I understand is a Lead gen but even for current lifetime members too? Ok well you ll get my email every week for now. Till it is part of the members download area, thanks once more, they are great! We knew that was coming! \o/ And so needed to remain competitive with Squarespace et al. Amazing work ET. Any chance there could be an option instead? Sometimes it’s not beneficial to do it this way, and better to download and install 🙂 Thank you. Thank you for another great layout! Thanks Jason for layout and inspiration. 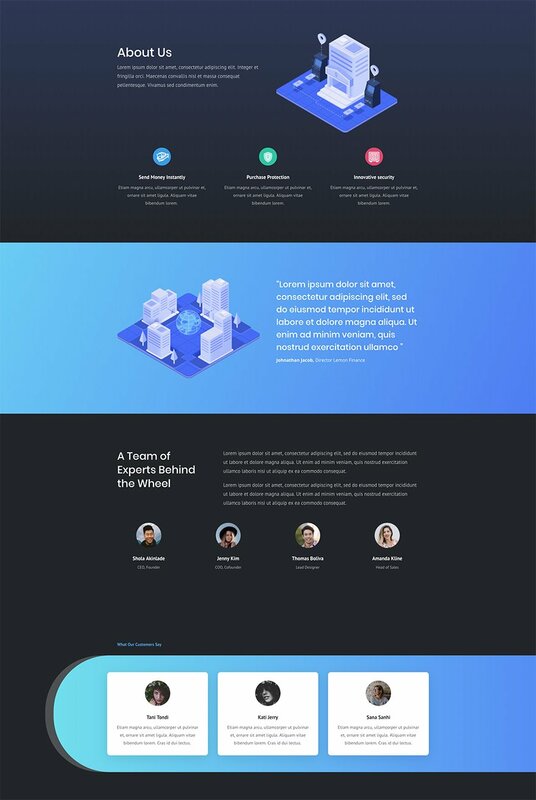 beautiful, but is there a way to create new images with the same design? How good are your drawing skills?? Very nice, I want to build one just so I can say I did, this layout is beautiful. Another nice layout. I like the curve borders at the bottom and top of the section. Thanks Divi team. 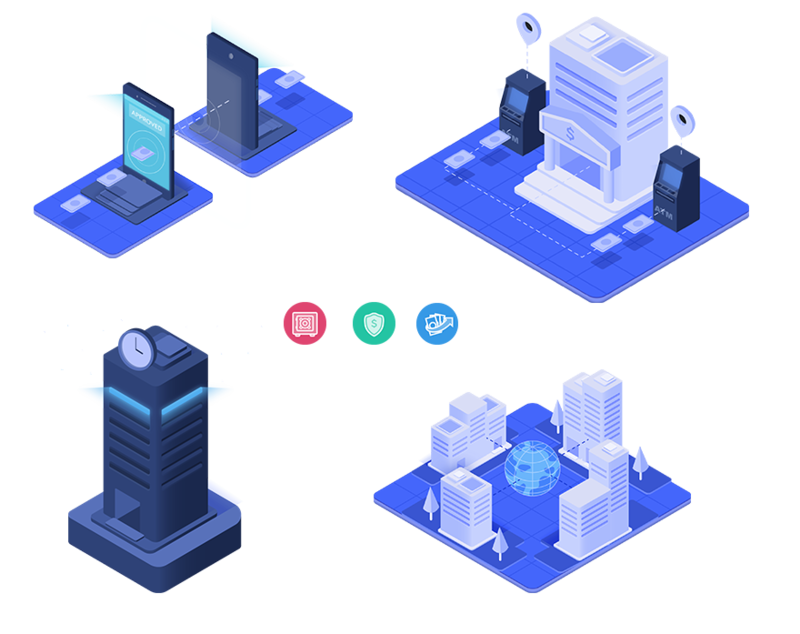 What payment gateway / systems are supported? (I could not see any sandbox payments working in the demo). 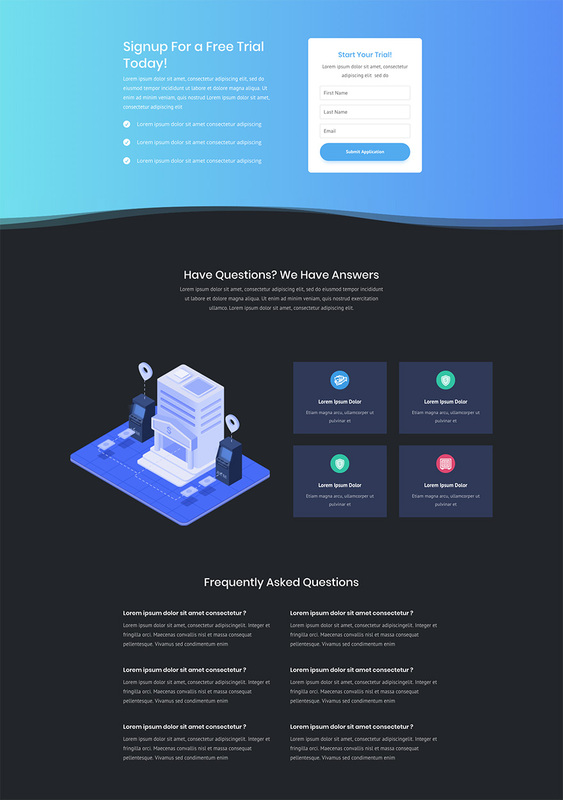 This is simply a design layout for your Divi theme. You will need to add the payment gateways yourself. 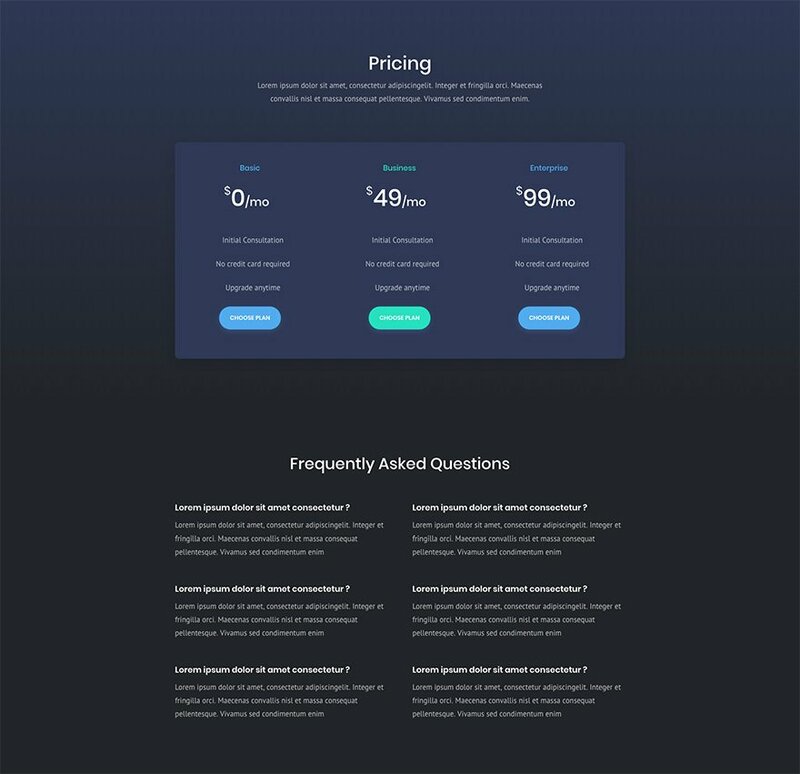 Ok, I see a Beautifull Design, and an Awesome Sign-Up Page/functionality. But How about the Login option? can I give you a feedback? is it possible that ET updates the download message/links in our member dashboard(or somewhere when we log in) once there’s a new layout/design releases? which would make me easy to download. now I have to enter our email here every time when new one releases. and need to wait for the email. of course I read blog post every time for detail after download. We are working on a solution for this. See Nick’s response above. I just checked Nick’s response. sounds great! Thank you from The Caribbean. I am a member of divi, love the image resource!!! But I need some other style image instead of payment, may I ask that where can I get more this-geek-style image? I am completely disgusted with Elegant themes and Divi. I have several websites with many many thousans of hours in work on all the different sites running Divi and this is the reply I get from support…..
Looks like your last update broke a lot of things. Apart from the pricing table showing html code, all of a sudden the tabs now also shows the html code and not bold etc. This issue appeared in 3.0.96 and it was recently solved. Please activate another theme, delete Divi, install a fresh version from Downloads, install it and activate it. After that unfortunately you’ll have to modify all the modules affected and remove the tags in the Module Settings. I would say it is too risky to continue with Divi. They don’t even bother to offer a software solution. Shame on you!! I’d be pretty annoyed at that. This layout is really beautiful. I liked some innovative and very interesting graphic solutions. For example, the solution used to create curved divider. These are jpg images, created with a graphic editor, that resume the gradient used as background. I’d like to do something like that. I would like to understand how to make the two gradients fit perfectly. Is there any way to get the page dividers in Illustrator format, and not SKETCH format? It’s cool layout, I really need it, I wonder about How’s look my website apply this layout after, Thanks Elegantthemes. Jason, “Simplemente genial” great layout, I am praying to this community of Divination, that please create layouts for EXTRA, magazines, news, blogs, please.